Silicon Valley company BlueStacks is announcing news at a rapid, constant pace these days as it aims to capitalize on the trend of bringing mobile games that are typically only playable on smartphones or tablets into the living room and onto television sets. 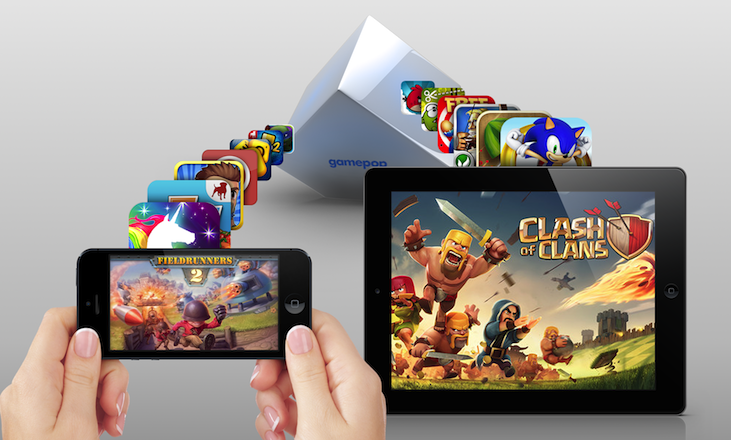 First it made some waves announcing GamePop, an Android video gaming console combined with a $6.99/month all-you-can-eat game subscription service that will essentially enable customers to play a wide range of mobile games on the big screen after installing a Boxee-style set-top box. Then, it announced that the hardware would cost $129 (this is on top of the subscription fee, which allows users to play as many games from the catalog as they wish, Netflix-style), and that it had added a bunch of games from several developers to the line-up. Today, the company is announcing the ability to include iPhone and iPad applications under the GamePop service umbrella, signing up ‘Fieldrunners’ maker Subatomic Studios for starters. “There will always be popular titles that are iOS-only, like Clash of Clans. Looking Glass enables these titles to be brought into the living room. The company isn’t sharing much about the GamePop box and controller specs but points out that its investors include the likes of Intel, Qualcomm and AMD, which coincidentally also produces the chipsets for both the upcoming Xbox One and PS4 consoles. You can pre-order the GamePop console now. No word on when the things will start shipping to customers, but the FAQ speaks of a “winter release”. Up until now, BlueStacks was best known for its App Player software, which now caters to 10 million users who want to play their favourite mobile games on a Mac or PC desktop computer. Like OUYA’s gaming box, its GamePop console runs on Android (Jelly Bean 4.2), and the technology that went into the hardware is completely separate from BlueStacks’ aforementioned App Player software. Games are stored on the console itself. Aside from the aforementioned investors, BlueStacks is also backed by the likes of Citrix and Andreessen Horowitz. Meanwhile, Kickstarter darling OUYA is gearing up to start selling its own Android-based video game console in retail stores at the end of next month, backed by a fresh $15 million in VC funding from Kleiner Perkins, NVIDIA and others. The OUYA console costs $99, but games need to be bought separately.